It's hard to take a picture of this cake because it disappears fast. In 2009, Oxmoor House Publishers came out with a book called Southern Living Comfort Food. The back cover of the book carried the following quote from Susan Dosier, a former executive editor at Southern Living: “Maybe a pound cake needs to be perfect because it’s the hallmark of Southern hospitality. It’s the handshake of friendship to a new neighbor or a tender beacon of sympathy for those who survive a loss. It’s a happy catalyst of cozy chats and midnight snacks…. Pound cakes nourish much more than the body. They feed the soul.” I wonder if Susan Dosier ever met my Dad. Daddy has always known his way around the kitchen. He used to make chocolate fudge and pecan divinity at Christmas and even though Mother did most of the cooking in the family, Daddy could put a meal on the table. But after the kids all left home, Mother went back to work and Daddy started baking in a big way. I think it probably started out with him baking a cake or pie occasionally just to help out while mother did other things like vacuum and dust and cook the main meal. Or maybe he would bake a cake or pie in the afternoon before Mother got home from work so she wouldn’t have to spend so much time in the kitchen when she got home. They always went to a lot of church suppers and community covered-dish events and desserts usually travel well. The favorite standby recipes were Cream Cheese Pound Cake, Coconut Pie, and Almost Sugar-Free Banana Pudding. People would compliment my mother’s cake or pie and she was quick to tell them she didn’t make it, the preacher did. He started to get a reputation. As Mother’s Alzheimer’s progressed, Daddy did more and more cooking and his reputation for pound cakes continued to grow. Diabetes prevents him from eating desserts except on special occasions, but he is still baking. A week seldom passes without Daddy making at least one pound cake. A few years ago he won a men’s cake-baking contest and he once donated a pound cake to an auction where it brought in $35. He takes pound cakes to church suppers and always brings home an empty plate. He often takes pound cakes to people who have been hospitalized and to families gathering for meals before funerals. He has also given them as birthday gifts. He made at least 10 for Christmas gifts this year. He has taken them to family reunions—ours and dozens of other families’ reunions as well. He once sent a pound cake to a college graduation in another state and when the graduate saw what was in the box, she cried. In the summer of 2008 Mother got sick and had to go to the hospital for what we thought would be a minor illness. But her body started to shut down and her Living Will was called into play. She had been firm in making sure we knew she didn’t want to be kept alive with feeding tubes and breathing machines. It was all spelled out, signed, sealed, and notarized. She was moved to Marion County’s Hospice House and we waited while days dragged into weeks. For more than 50 years, Daddy had ministered to hurting families and prayed at bedsides. He wasn’t used to being on the other side of the bed. Church members prayed for us and we held firm to the belief that death ends life on earth but a better life awaits. We were especially touched by the kindness and compassion of the Hospice employees. They lovingly took care of us as well as Mother. A few weeks after the funeral, Daddy stopped by to visit the Hospice staff to say “Thank you.” He took them a pound cake. Cream the butter, margarine, cream cheese and sugar until fluffy. Add eggs, one at a time, along with cake flour, salt, and vanilla. Mix until smooth. Bake 1 ½ hours (or a little less) at 325 degrees. You can bake it in a tube pan, a bundt pan, or 2 loaf pans. Shorten the baking time for loaf pans. Daddy doesn’t use special cake flour and his cakes work just fine. Sometimes I use 2 sticks of butter and one stick of margarine instead of the other way around. 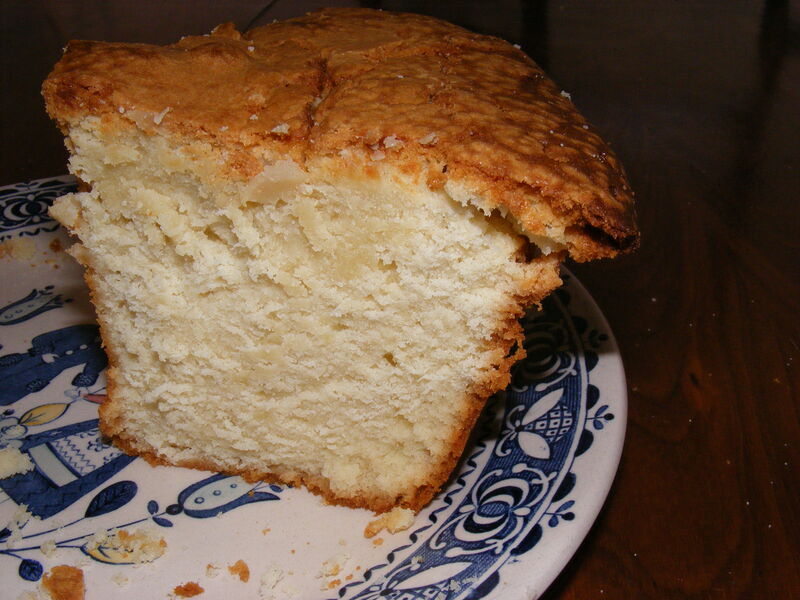 The secret to a pound cake (according to Mrs. Kate Randall of Conner, Florida, who lived to be 103 and was also famous for her cakes) is to cream the butter/sugar mixture really well before you add the eggs. Don’t beat it too long after you add the eggs. This entry was posted in Uncategorized and tagged Birmingham Baptist Association, cream cheese pound cake, Karen Estes Lowry, Kate Randall, McElwain Baptist Church, Ocala National Forest, Ocklawaha Bridge Baptist Church, Patsy Arnold, pound cake, pound cake packing preacher, Raymond Estes, Southern Living, Susan Dosier, The Alabama Baptist. Bookmark the permalink. I cant get enough of this wonderful cake. I remember when Bro. Raymond made one for my sister and she opened the tin and started crying-Actually I think we all did!! !